Flash deals and tickets get snapped up fast. Typing your credit or debit card details is slow and time-consuming. 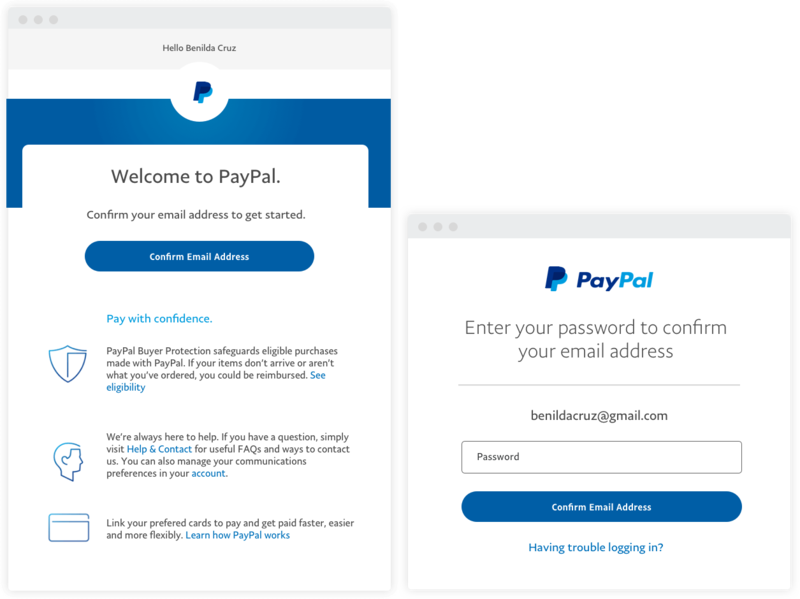 PayPal helps you score more buys with speedier checkouts. You won’t need to look for your wallet or card while shopping online with PayPal. And with One Touch™, you can go straight to review and pay. Each time you disclose your financial details is another exposure to risk. Using PayPal keeps your financial information more securely encrypted no matter which website you shop on. PayPal lets you link all your cards to one place and choose your preferred card to pay. You can still earn reward points* for purchases. You can also enjoy Buyer Protection for your purchases, as well as free return shipping for eligible goods^. 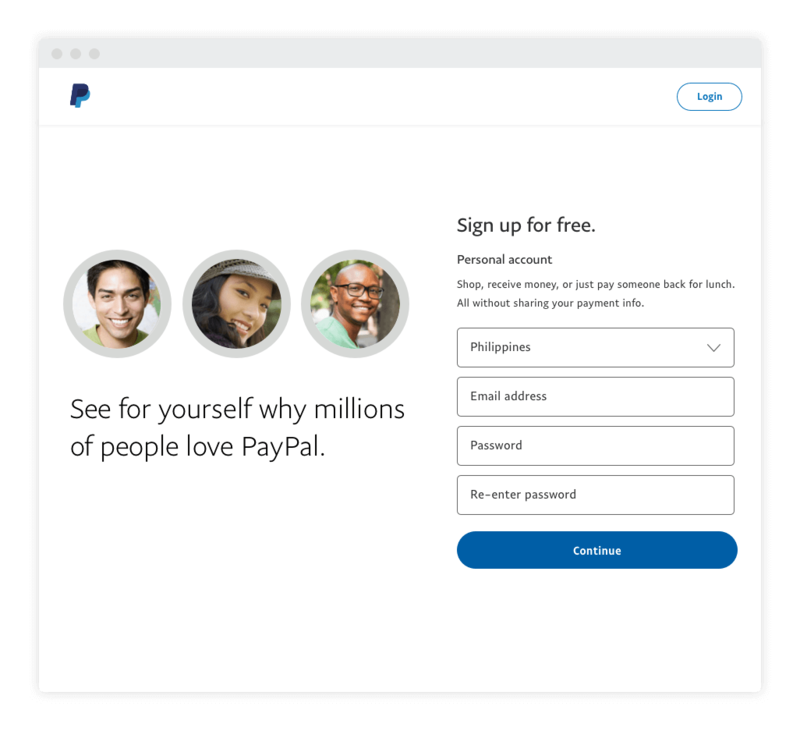 With PayPal accepted in more than 200 countries and regions, you can shop brands across the globe and pay in your preferred currency. You can also send money, receive payments, and more with your account. Shopping is just the start. 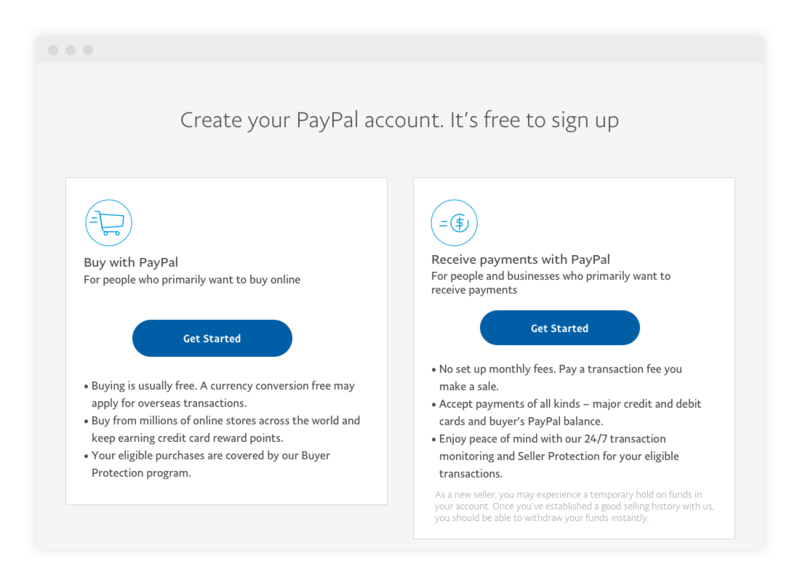 Yes, it is absolutely free to set up your PayPal account, and you can do it right now! Read on to find out how. Signing up is easy and we’ve broken down the steps to guide you through the process. You can choose to sign up while checking out on any online store that accepts PayPal. 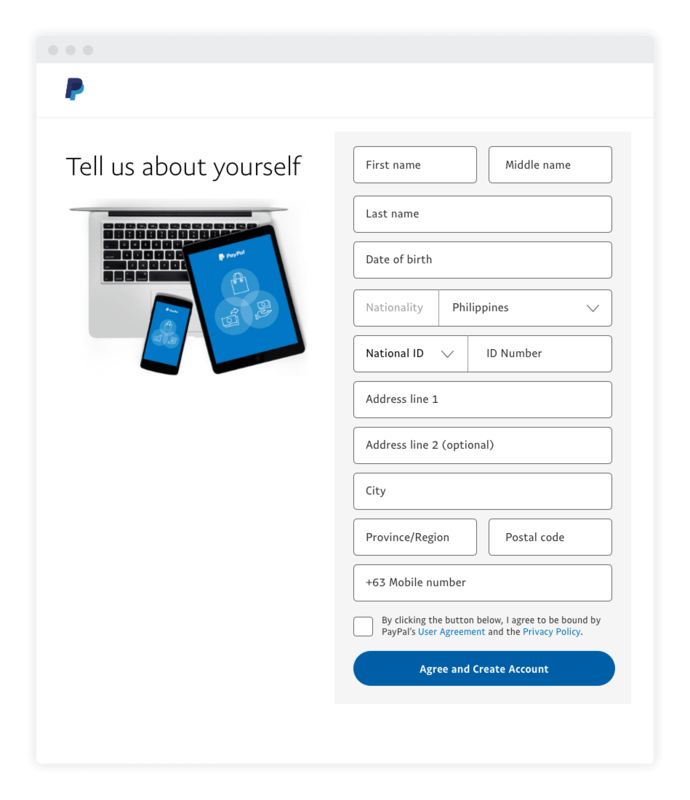 All you need to do is to choose PayPal as your payment option, and you will be brought to PayPal’s secure network where you can enter your personal and billing information. Already signed up for an account? Here’s how to add a credit or debit card. Signing up can also be done on our website. Simply select Get Started in the ‘Buy with PayPal’ box. Let us know the email address and the password you want to use. They will be required to log into your account in the future, so make sure to choose a password only you know. If you’ve already got a business account set up, you’ll need to set up your new account with a different personal email address, bank account and credit or debit card. You can also choose to upgrade your personal account if you want a more secure payment solution for your business. Provide us with more details such as your name, date of birth, address and contact details. Do ensure the details are the same as those in your National ID card, and don’t forget to check the box to accept our terms and conditions. 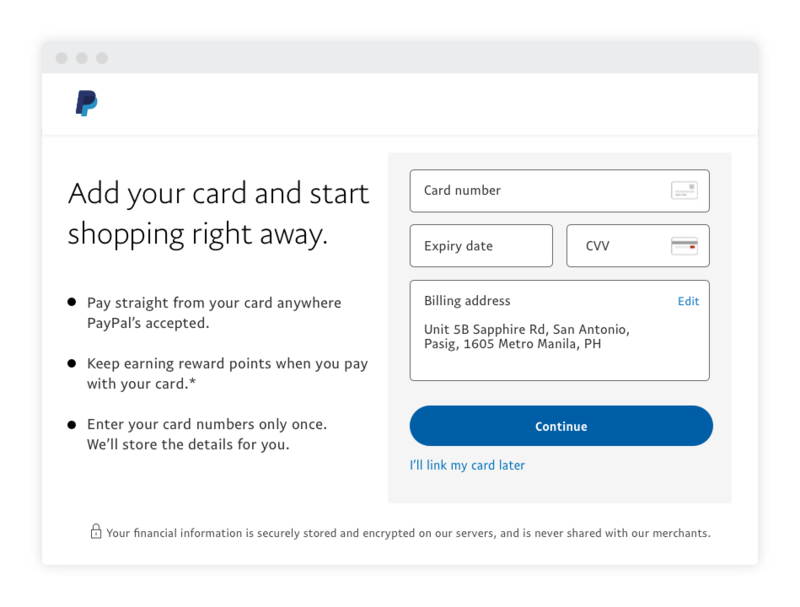 Adding a credit or debit card to your PayPal account not only saves you time when you shop online, but helps safeguard your financial information and purchases against potential fraud. You can link your credit or debit cards to start shopping immediately. Once your account has been created, we will send you an email to confirm your email address. We’ll also email you each time you make a payment so you can easily track your shopping. Click on Confirm Email Address to verify your email address on our network. 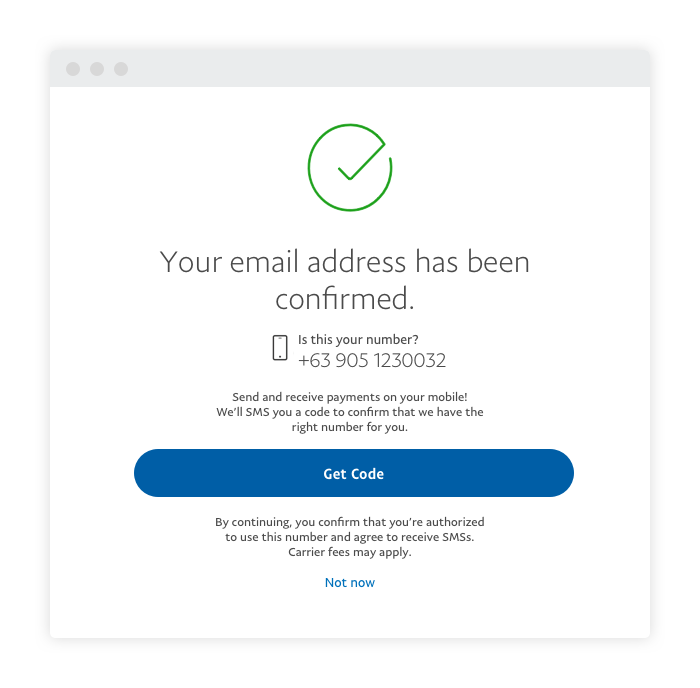 You can also verify your mobile number by clicking on Get Code to start sending and receiving money on your mobile device. That’s it, you now have your account set up and ready to go! 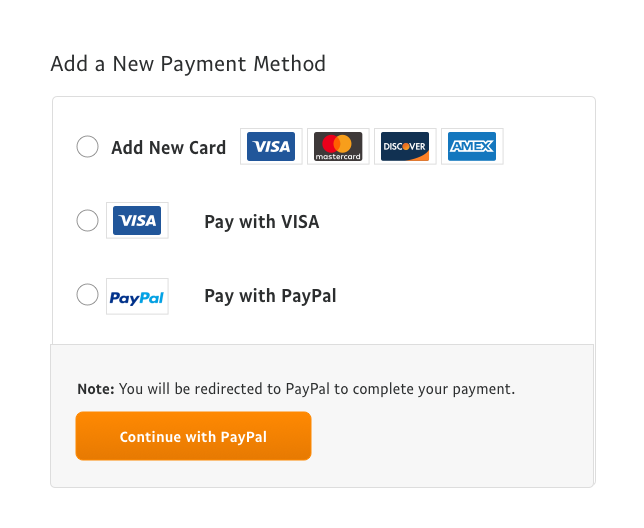 Still unsure of how you can use PayPal? Here's a video to find out more. ^Terms and conditions apply. Please refer to our Buyer Protection and Refunded Returns pages for more information.